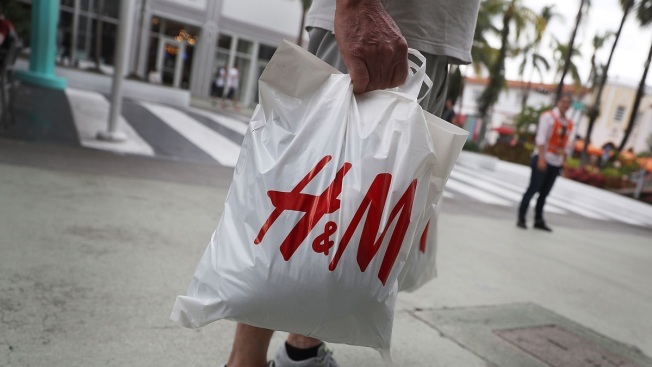 In this January 9, 2018 file photo, a customer carries H&M clothing store bags in Miami Beach, Florida. H&M apologized after the Swedish clothing retailer's website in Britain showed a black child model wearing a hooded sweatshirt that said "coolest monkey in the jungle." Swedish low-cost fashion brand H&M says it has appointed a diversity leader after having been accused of racism over an ad showing a black child dressed in a hoodie reading "coolest monkey in the jungle." H&M said late Tuesday on its Facebook page that the group's "commitment to addressing diversity and inclusiveness is genuine, therefore we have appointed a global leader, in this area, to drive our work forward." The Stockholm-based company reiterated that "the recent incident was entirely unintentional" but "demonstrates so clearly how big our responsibility is as a global brand." NBA star LeBron James and rapper Diddy were among those who had responded with outrage to the ad. American rappers The Weeknd and G-Eazy cancelled partnerships with H&M. In South Africa, there were protests at some H&M stores, while the response has been more muted in Europe. The case highlights how important it has become for multinationals to take into account differences in cultural views and sensitivities between the markets it sells in. That's especially true as social media makes it possible for an ad posted in one country to be shared and viewed anywhere else in the world.